The following is a brief summary of poverty stats and how OPFs compare to the national averages. 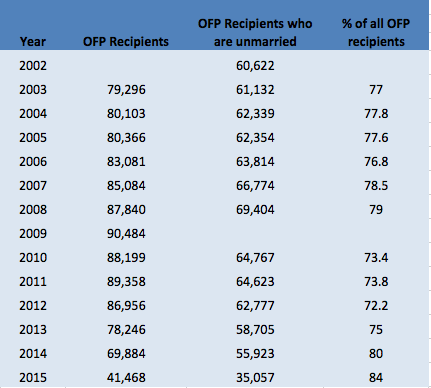 The stats highlight clearly highlight OPFs as an impoverished cohort. In 2017, the at risk of poverty rate was 15.7%, a reduction of 0.5% on 2016 figures. However, the at risk of poverty rates continue to remain high amongst one-parent families (OPFs) at a rate of 39.9% for OPFs, meaning individuals in OPFs households are approximately 2.5 times more likely to experience poverty than other cohorts (CSO Ireland, 2018). In 2017, the national deprivation rate was 18.8%, a reduction of 2.2% on 2016 figures and 12.7% reduction on 2013. There was a reduction in deprivation rates for OPFs in 2017 on 2016 of 5.6%, however, in comparison with the national average deprivation rates remain high for OPFs at 44.5% in 2017 (CSO Ireland, 2018). In 2017, the consistent poverty rate was 6.7% which is a significant reduction on 2016 of 1.6%. In comparison, the consistent poverty rates for OPFs was 20.7% meaning OPFs are three times for likely to experience consistent poverty based on national averages. Although there has been a reduction on OPF consistent poverty by 3.9% on 2016 figures, OPFs still experience significantly higher rates than other cohorts based on national averages (CSO Ireland, 2018). There were 979,590 children under 15 living in the State on Census night of whom 138,533 were living in one parent families (14%). 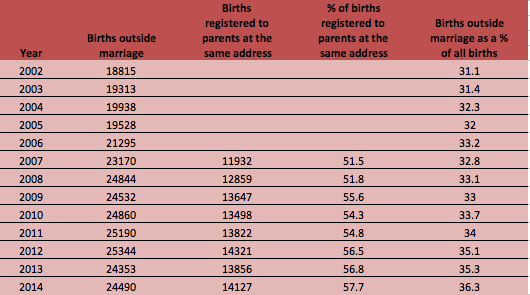 There were 57,671 cohabiting couples with children under 20, representing 9.2% (7.5% in Census 2006) of all couples with children under 20 in 2010. The number of children of all ages living with cohabiting parents increased from 74,500 in 2006 to 104,665 in 2010, representing an increase of 7%. 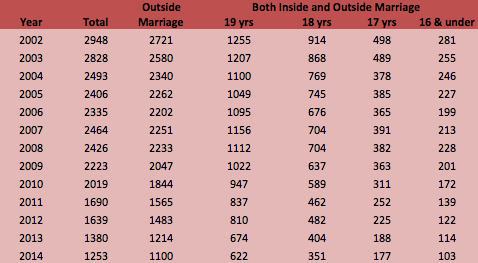 The average age of mothers outside of marriage/civil partnership was 29.6 years. One-Parent Family Payment (OPFP) is a means-tested payment for men and women who are caring for a child without the support of a partner. The Survey on Income and Living Conditions (SILC) in Ireland is a household survey covering a broad range of issues in relation to income and living conditions. It is the official source of data on household and individual income and also provides a number of key national poverty indicators such as the at risk of poverty rate and the consistent poverty rate. The EU-SILC figures for 2013 show that one parent families continue to experience a disproportionate level of poverty. It is important to note that one parent families in the context of the EU-SILC data refers to parents who are divorced separated, widowed and parents who have never been married. Lone parent households continue to be at a high risk of poverty with a rate of 28.4% being recorded for individuals in these households. This is compared to a 16% at risk of poverty rate in the general population. Lone parents represent 7.3% of the population. 18.8% of children are at risk of poverty; they experience the highest rate of consistent poverty compared to other population groups (those over 65 years and the 18-64 age cohort). 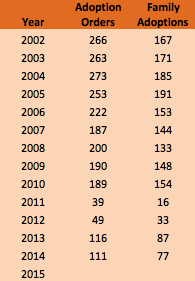 Lone parent households report high levels of deprivation at 56%, an increase of 11.9% since 2009. The deprivation rate for the general population is 24.5%. 32.1% of Children were experiencing deprivation in 2011. This figure has increased from 23.5% in 2009. 16.4% of lone parent households were living in consistent poverty in 2011, this compares to 6.9% of the general population. 16.4% of women experienced an ‘unintended pregnancy’, while just under 16% of women experienced a ‘stressful’ pregnancy, where this stress was solely due to the pregnancy itself. Women whose pregnancies were both unintended and stressful at the same time are labeled as experiencing a ‘Pregnancy Crisis’. This group comprised 3.4% of women in the sample. Marital status is significantly associated with crisis pregnancy, with unmarried-cohabitant parents 3 times more likely than married parents to experience crisis pregnancy and solo parents 4-5 times more likely. Solo Parents are two and a half times more likely than married parents to live in a household where anyone was receiving some form of social welfare payment. Three out of every ten Solo parents (27.7%) were claiming One-parent family payment. Solo parents are 10 times more likely to be welfare dependent, 9 times more likely to be on Rent Supplement and half as likely to as married parents to have been on Jobseeker’s Benefit. Among solo parents, one quarter had no contact whatsoever with the father of their child. Among solo parents, 50% of fathers made no financial contribution to the maintenance of their child.